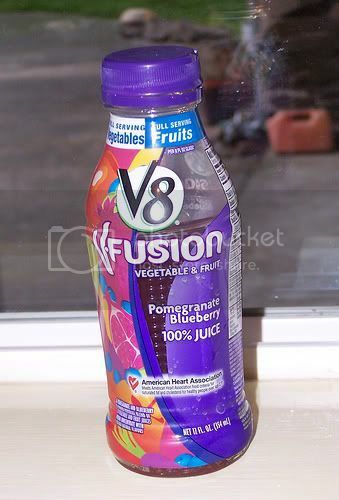 That's V8's slogan for the V-Fusion juice. And I got to say, taste really isn't an excuse anymore. It's even a full serving of fruit! This stuff is good, they even have a raspberry flavor now! yum. But did you know they make potato chips with half a serving of veggies? Did you know Spaghetti-o's have a full serving of veggies? For someone as picky as I am, these are great alternatives to eating smelly green things that taste funny. Spaghetti-o's were always my favorite growing up... and now I can get in my veggies too! And the juice... it's only 8 little ounces. EIGHT ounces. For a complete serving of fruits and veggies! You can just chug it with each meal. Hey, you're done for the day. Everyone is asking me if I think life will be different after the big day. if we get in a fight... i still have to look at him. All of these things are sent by mass texts to everyone involved. We told them we were getting married in a couple weeks and no one ....NO ONE has even said "Congratulations" or "How exciting!" or "Let's have a party!" Im thinking either a)they don't like us anymore 2)they are jealous or iii)maybe it's not something to be celebrated, in their eyes. Not like it matters, I am super excited about the honeymoon, anyway. I'm thinking that will be way more fun! Less than 5 weeks until the fiance and I tie the knot. The official date is May 15th. Started referring to each other as "husband" or "wife"
All in all, a semi productive week. He even found a job listing for a graphic designer in our area who is HIRING, and called him today, sending him an email with a resume, portfolio, AND was told by the owner to call back next week. Bonus: The job starts after the honeymoon. I was curious to what all the hubub was about on the 2012 nonsense. Basically, the Mayan calendar ends on December 21, 2012. No one knows why or anything. So NATURALLY it is to be assumed that the world will end. Yeah... so I don't know how to prepare for any of those. Oh well, if the world ends on Dec 21st, I guess I can take back everyone's Christmas gifts! So this dreary weather seems to have everyone down. It was lovely over Easter but now it's horrid and very blah out. I don't have motivation to do anything really. It doesn't help I am really trying to buckle down on finances and look for a job. Believe it or not, it's near impossible to find one that I can do because I have a bum ankle. Luckily, I was able to file for more unemployment. The fiance (soon to be husband, in 4.5 weeks!) got a freelance job designing a website, so that's awesome. I shook my money tree last week and everything looks like it will work out for now. I was on the hunt today to see if I could boil an egg in the microwave, so I asked Chacha and got told some wrong information. I looked it up myself and I found one answer on a forum that surprised me and made my frontal lobe hurt. "I boiled an egg in the microwave for 22 minutes and when I tried to peel it, it was brown and exploded all over me. DONT try it, you can't boil an egg in the microwave!" Maybe it's just me, but 22 minutes is about... 18 minutes too long. As an added bonus, I micro-boiled an egg successfully, and it only took 4 minutes. One was this college age girl, very annoying with a smoker's voice and a perm and a piece of steel shot through her eyebrow. She was all peppy high-5 talking a mile a minute about some contest or another for her communications class where if her team wins she goes to Fiji... whatever. "Oh I bet you got sunburnt really bad." "Listen sweetheart, maybe you don't pay attention in class because your head is filled with thoughts of Fiji and good looking local boys and alcohol, but I am pretty damn sure they don't tell you to insult someone you are trying to sell something too. And when I was in school. which was 6 months ago, they had you selling candy bars, not magazines. Thirdly, if you want to go so bad, get a job and save up, it's easier than conning people into magazines they don't want. Also, in case you didn't notice, there are large signs at each entrance saying we dont accept solicitors, so you leave now, or I call the courtesy officer on you."